After my dumpling lesson last weekend with Foodisms of The Office Broccoli I felt like I could stuff anything into those little skins and get away with it. As I was driving home I was hatching a plan to create an ‘appetizer’ entry for the Canadian Lentil Revelations Challenge using Beluga lentils and creating some other colours and flavours with cilantro and turmeric. I can’t believe how super healthy these are for you…the low GI, high fibre/protein combo of lentils and shrimp with the anti oxidant/anti inflammatory benefits of turmeric make me feel like I have goodness flowing through my veins. Heath benefits aside, this is actually one appetizer that also tastes amazing and really…how many foods taste good and are actually healthy for you? I began by cooking 125 grams of lentils in 2 cups of water for about 25 minutes. When they were just soft I rinsed them and set them aside to cool while I got the rest of the ingredients for the filling ready. I added the shrimp last so that it would stay relatively cool for the whole time I was making the dumplings. I made sure to have my dumpling making station organized and ready so that I could start making dumplings as soon as the filling was mixed. Filling dumplings is pretty mindless work. It helps to have a friend to chat with or to have the radio on so that you can get the job done as soon as possible. If you keep your mind busy, the task will be done in no time at all. After I had made a half cooking tray of dumplings I set a large pot of water to boil and lined a steamer basket with cabbage leaves. The half tray of dumplings allowed me to steam one batch of dumplings, then pan fry the rest. In both versions you can tell they are done by the way the skins change and become slightly translucent when they are ready. I thought that the taste of the dumplings was slightly better in the fried version. 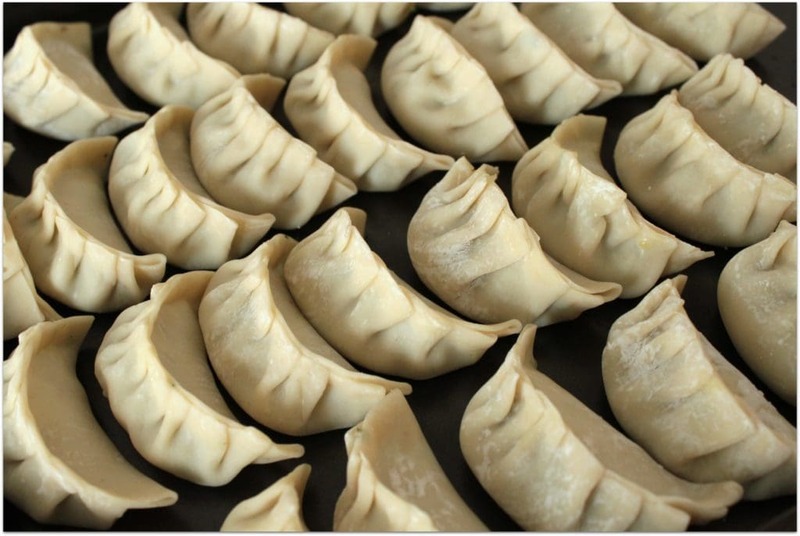 To fry the dumplings in the pan, make sure each dumpling has a thin film of oil on it’s bottom and heat on med-low heat until the bottoms become crispy brown. Add water by the tablespoon (maybe about 4 tbsp) and put the lid on so they steam a bit. 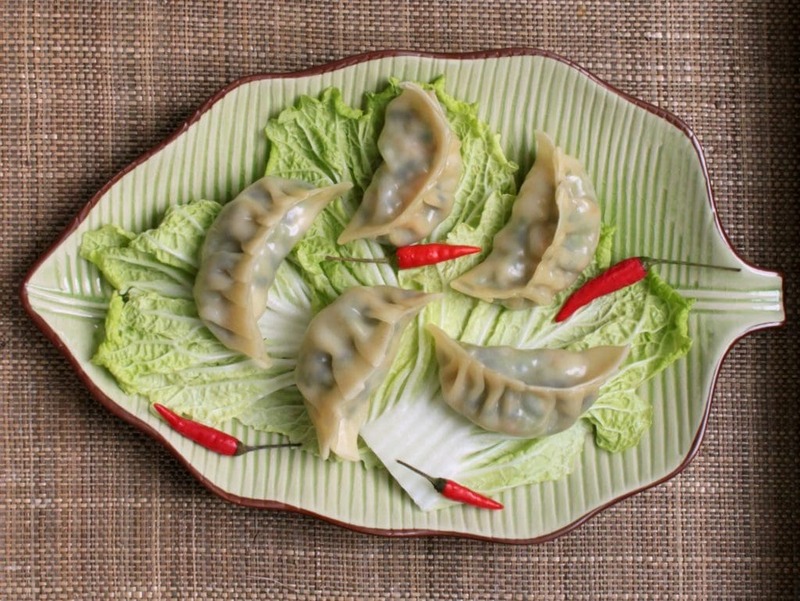 Add water sporadically about 2-3 times until the dumpling wrappers change from dull to glossy. This maybe takes about ten minutes. rice flour for thickening mixture. Add by tbsp until you think the mixture will hold nicely. Begin by cooking 125 grams of lentils in 2 cups of water for about 25 minutes. When they become slightly soft, rinse them and set them aside to cool. Assemble the dumplings and set each dumpling onto a waiting tray. 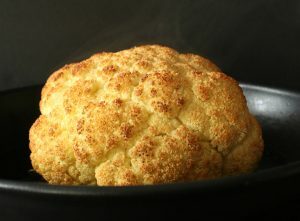 To STEAM: Set a large pot of water to boil and line a steamer basket with cabbage leaves. Arrange the dumplings on the cabbage then cover and steam. You can tell they are done by the way the skins change and become slightly translucent when they are ready. 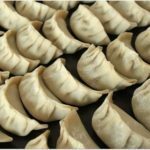 To FRY: Arrange the dumplings in a frying pan, making sure each dumpling has a thin film of oil on it's bottom and heat on med-low heat until the bottoms become crispy brown. Add water by the tablespoon (maybe about 4 tbsp) and put the lid on so they steam a bit. 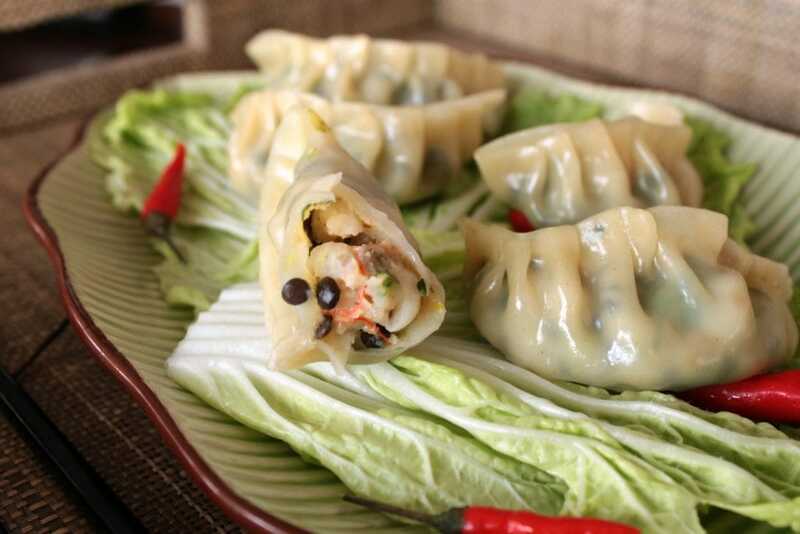 Add water sporadically about 2-3 times until the dumpling wrappers change from dull to glossy. This maybe takes about ten minutes. OMG you are a pro! Those look delicious and so well presented too! 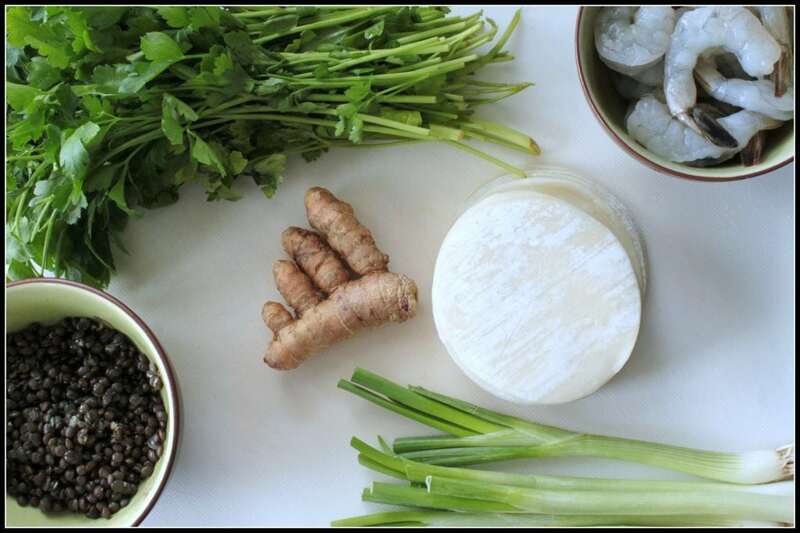 I had fun, I felt very inspired…three of my favourite ingredients; shrimp, turmeric, and cilantro. YUM! The sauce was sitting there on the table for a while and Shaun came home to have some dumplings around 4. I think the chili’s had steeped a bunch by then and it was quite hot! 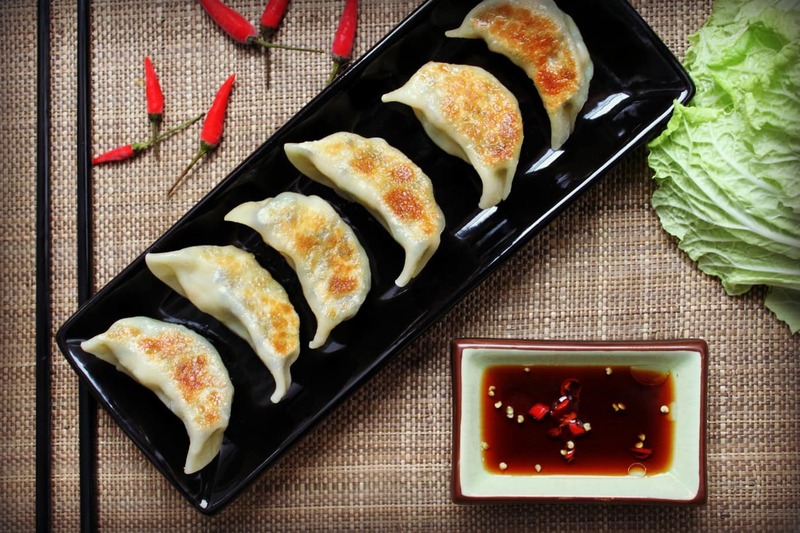 Love the photos – the dumplings both sound and look yummy! I will have to try this (but I have to survive April first). yummy! Great idea for something for astro meeting catering -and busy work while i listen to brainscience podcast ( my current addiction) How long do i steam for? I am definitely making these. Any suggestions on where to find fresh turmeric, beluga lentils? A quick google coughed up Dad’s Organic Market and they have a form that you can fill out to see if they have your grocery needs in stock. I don’t know why they just don’t list stuff. Anyway, try there and good luck. I lucked out on the second try Beluga lentils are sometimes hard to find but I wanted to use them because they hold their shape better than the others. If you find fresh turmeric for the love of God, use gloves and an old cutting board. you could try the recipe with half a teaspoon of ground turmeric as well. and it is worth the hunt if you find fresh turmeric. My family loves it…I’m marinating some chicken in it right now. Unfortunately it stains everything. Very creative use of lentils! So delicious and fresh! Great job on the blog Bernice, very well done and engaging! Those dumplings look amazing! Thanks for the pics along with the detailed instructions. I blogged about Lentils today, too! Lentils seem to be very popular these days…I’ll have a look at your post. wait, when I click your profile I get Blissful Place and the last post is from 2012. Can you post your lentil link? Love lentils, love this idea! How did I miss this absolutely delicious appetizer on the Lentils FB page! These are fab! I love pot stickers/wontons/dumplings of any kind but where there is shrimp I am there first! Excellent recipe! Thank you very much…did you submit a recipe or two? Yes! I had 5 recipes. It was so much fun. I’m the one who commented on your sweet potato lentil crust quiche. That’s how I got here! 🙂 loved your recipes. I really enjoyed the challenge too. It was nice to flex my creativity a bit and I also found out the family really likes lentils. It was a great challenge!